In the past few years, for a thousand times the lies of US claims in the so-called “War on terror” were uncovered. By relying on the criminal bands of the Northern Alliance, the US made a game of values like democracy, human rights, women’s rights etc. thus disgracing our mournful nation. The US created a government from those people responsible for massacres in Pul-e-Charkhi, Dasht-e-Chamtala, Kapisa, Karala, Dasht-e-Lieli, 65,000 Kabulis and tens of mass graves across the country. Now the US tries to include infamous killers like Mullah Omer and Gulbuddin Hekmatyar into the government, which will be another big hypocrisy in the “war against terror”. The reinstatement of the Northern Alliance to power crushed the hopes of our people for freedom and prosperity into desperation and proved that for the Bush administration, defeating terrorism so that our people can be happy, have no significance at all. The US administration plays a funny anti-Taliban game and pretends that a super power is unable to defeat a small, marginalized and medieval-minded gang which is actually her own product. But our people found by experience in the past few years that the US doesn’t want to defeat the Taliban and Al-Qaeda, because then they will have no excuse to stay in Afghanistan and work towards the realization of its economical, political and strategic interests in the region. 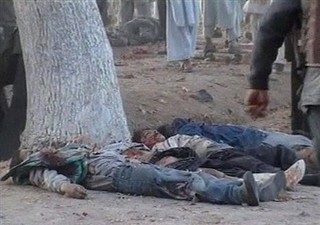 After about seven years, there is no peace, human rights, democracy and reconstruction in Afghanistan. On the contrary, the destitution and suffering of our people has doubled everyday. Our people, and even our unfortunate children, fall victim to the Jehadis’ infighting (Baghlan incident), the Taliban’s untargeted blasts and the US/NATO’s non-stop bombardments. The Northern Alliance blood-suckers, who are part of Karzai’s team and have key government posts, continue to be the main and the most serious obstacle towards the establishment of peace and democracy in Afghanistan. The existence of tens of illegal private security companies run by these mafia bands are enough to realize their sinister intentions and the danger they pose. Human rights violations, crime, and corruption have reached their peak, so much so that Mr. Karzai is forced to make friendly pleas to the ministers and members of the parliament, asking them to “keep some limits”! Accusations about women being raped in prisons were so numerous that even a pro-warlord woman in the parliament had no choice but to acknowledge them. Rabbani, Khalili, Massoud, Sayyaf, Fahim, Ismael and other criminals for the sake of being “ISI” and “VEVAK” agents could become “leaders” in the early 90’s, invited their god-father General Hamid Gul of ISI to become their army chief. But today they raise anti-Pakistan slogans to hide their corruption and wrong-doings. In this act they even go further and abuse Pakistani people. But they never talk about the dirty act of Pakistan in creating fundamentalist bands and imposing them on our people. More importantly, they keep silent about the wider, more devastating and more active meddling of the brutal Iranian regime in Afghanistan through its cultural and media agents. Pro-Iranian regime politicians and intellectuals are as much traitorous to democracy and human rights as the intellectuals and politicians who, from an ethnocentric and reactionary point of view, call the barbarism and terror of Taliban a “national armed resistance,” and shamelessly defend them. The Revolutionary Association of the Women of Afghanistan (RAWA) has announced a number of times that when the legislative, administrative and judicial bodies are ruled by drug-lords and warlords or their Talibi, Gulbudini, Parchami and Khalqi accomplices, they will never do anything positive for our deprived people. Rather these bodies will act as a mechanism to continue the ongoing crime, drug-trade and looting by these mafia bands to become richer. If the US government replaces Karzai with a new puppet, even if he is not from among the Jehadi criminals, it will be just a deception of our people and an attempt to put the responsibilities of today’s tragedies on the shoulders of a single person. Such a move will have no positive outcome for our nation. Only a president who rely on people and come to power through a fair election, free from any kind of dependence or dealings with the fundamentalists, would be ideal for Afghan people. Instead of defeating Al-Qaeda, Taliban and Gulbuddini terrorists and disarming the Northern Alliance, the foreign troops are creating confusion among the people of the world. We believe that if these troops leave Afghanistan, our people will not feel any kind of vacuum but rather will become more free and come out of their current puzzlement and doubts. In such a situation, they will face the Taliban and Northern Alliance without their “national” mask, and rise to fight with these terrorist enemies. Neither the US nor any other power wants to release Afghan people from the fetters of the fundamentalists. Afghanistan’s freedom can be achieved by Afghan people themselves. Relying on one enemy to defeat another is a wrong policy which has just tightened the grip of the Northern Alliance and their masters on the neck of our nation. By publishing the book “Some Documents of the Bloody and Traitorous Jehadi Years”, RAWA has taken another small step in unmasking and prosecuting the war criminals of the past three decades. But we will not stop here. In the face of continuous threats by the terrorists sitting in the parliament and the government, we will not be intimidated and despite the passivity and compromises of intellectuals in this regard, we are determined that with the help of justice-loving people and organizations of Afghanistan and around the world, will work to push the war criminals into a court of justice and reclaim billions of dollars worth of national assets from them. Only then the eyes of our grief-stricken people may no longer burn endlessly for justice and democracy.